Oh my goodness! Is there anything sweeter than newborn photography? 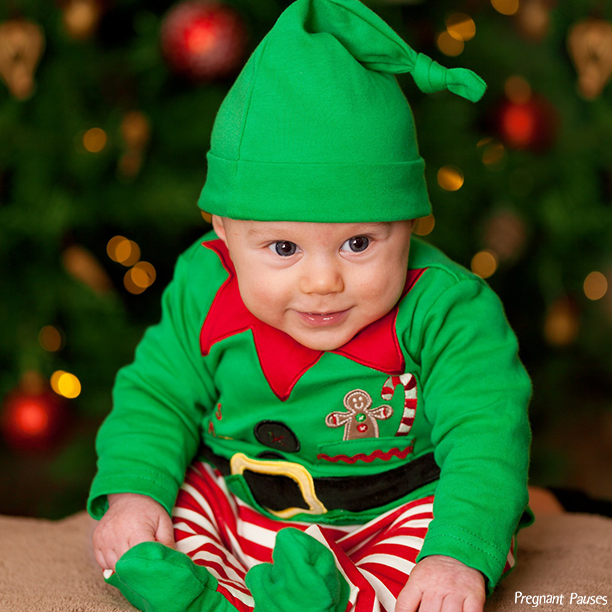 How about newborn photography at Christmas time with a backdrop of snow and twinkling lights? Or the naked baby curled up under the tree wearing nothing but a Santa hat? What about the little reindeer antler headbands? Alright, you get the point. Christmas is likely the flashiest and dressiest time of year, and the only time when gaudy is truly acceptable. There are never enough Christmas tree lights; there are never enough presents under that tree. There are never enough cookies, and there are never enough babies wrapped in candy cane print scarves sleeping on their bellies. I’ve often heard expecting women remark over the holidays that Thanksgiving or Christmas could be their last pregnant meal and that they better take full advantage of it. I often find it discouraging because it implies two things. One, that pregnancy is a time to over-indulge, and two, that postpartum is a time to diet. Both are wrong. Yes, you need around 300 extra calories per day while pregnant to support the bun in your oven. Still, all calories consumed should be accounted for with nutrition in mind. It doesn’t mean women should tack on 300 calories in cinnamon rolls or potato chips. Nonetheless, regardless of weight gain during pregnancy, women shouldn’t be in a rush to lose the weight immediately after having that baby and Christmas affords them to luxury of understanding that. It would just be plain cruel to expect a woman to have a baby and then avoid the ham and mashed potatoes at Christmas dinner or the leftovers the next day. Furthermore, when it’s the season of fruit cakes and peanut butter blossoms, the last thing a new mother needs is to worry about how many she ate when she was up for a 3 AM feeding. Breastfeeding really takes the cake, though — pun intended. Women who breastfeed need even more nutrition than when they are pregnant. They should be consuming around 500 extra calories per day. That means seconds are in order after Christmas dinner. Don’t begrudge yourself. Eat up. Likewise, there are many foods that can actually help to boost a woman’s milk supply. Oatmeal is a great option, and an even better one when baked into oatmeal raisin Christmas cookies or a fruit crumble for Christmas morning. Alright, it’s not all about the mom. Dad’s matter, too, and Christmas time is notably the best time to give birth, because no one is going to miss you at work. Short of Santa and Mrs. Claus having a baby, most parents can afford to take time off over the holidays. Many already have that time accounted for, in fact. Likewise, brothers and sisters who attend school are already slated to have a couple weeks off at home to help out with the new little family member. Aside from having lots of assistance settling into the new routine, Mom and Dad can sleep in if their bundle of joy is not so joyous in the wee hours of the night. In addition, grandparents and family friends who have been waiting in anticipation alongside the blessed couple for nine long months and come visit at their leisure over the holiday season to wish you well. Slapping your maternity leave and Christmas vacation back-to-back isn’t such a bad idea. No mother who has had to struggle with going back to work and leaving her little one — sometimes as young as six weeks old — with someone else would argue that. Lazing around the house in your favorite pajamas breastfeeding and effortlessly shedding some postpartum pounds while chowing down on cookies and cakes doesn’t sound so rough, does it? Folks, if I hadn’t done it already, I’d do it again. But two birthdays during the week of Christmas is a different story moving on into the rest of our lives year after year. When you look back on Christmas’s gone by after having a yuletide baby, it will no longer be difficult to decide which one was your favorite. It wasn’t that year you turned five and got a power wheels. It wasn’t the first Christmas with your spouse. It was the year you had your bundle of joy in your arms as you gazed at the twinkling lights on the Christmas tree. After all Christmas is all about birth, love, warmth, and celebration. What better time is there to have a baby?